I'm having vertical banding on some of my prints, Please see photo. 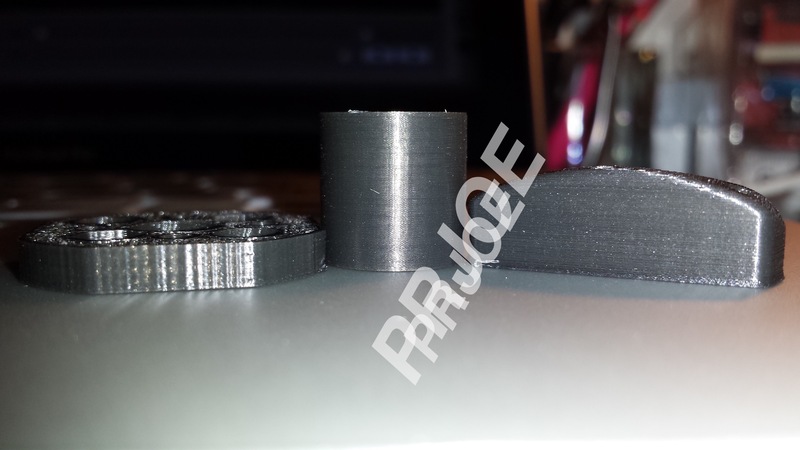 These 3 parts were sliced and printed with the same slicer, printer and same settings, Simplify3D. Please note the quality in the part to lhe left and compare to the ones in the middle and right. Hope someone gives some ideas where should I look for this issue? Edited 2 time(s). Last edit at 04/27/2015 05:31PM by prjoe. I use Simplify3d too just lower your infill to perimeter overlap, that will fix the problem. If the infill % is low and the outer walls are thin the infill will cause vertical ridges like that. If the ridges don't correspond to the infill, maybe you changed the acceleration or jerk settings in the printer's firmware. Tried lowering infill to perimeter % but no dice there. Still having the same vertical ridges. What has me scratching my head is why are the other parts not showing this defect? Could it be somehow embedded in the STL file? Just to keep looking for suspects, I took apart and re-assembled the extruder/head assembly and looking for slack of some sort, but everything seems alright to me. As mentioned In the post I'm new to all this fun 3D printing stuff, so forgive me if I ask a stupid question. Is there a jerk setting that can be changed in Simplify3D? If that's a firmware setting as in Marlin/Arduino, then I have not tweaked with any of that. If this setting is at the slicer level, then I might have changed it without knowing. Can you please explain a little more what this Jerk parameter is all about? The jerk is a Marlin setting, you can do a g code command to change it via pronterface (Simplify3d won't send those g code commands). I think I found your problem though (hopefully). I was printing a piece that have some thin walls and I decided to use the "allow gap fill" in the Advanced tab, and it created those same ridges you have. I set a 10% overlap and that was enough to cross the perimeter. See if you have that feature activated and if so reduce the overlap to 2 - 5% or just deselect it. Will try your suggestion tonight after work and post results. I have a similar issue and the only way I get rid of it is by slowing the print speed down. Took my delta last night and reworked the belts, made sure the carriages had no slack or wiggle, tightened the wheels aligned the top frame and pullies at the same height on the vertical extrusions, measured with calippers. In Simplify3d tried ggherbaz suggestion on reducing the overlap % to 5, and also took tmorris9 advice and lowered the print speed. The banding has reduced a lot, the print is much better, maybe 90% better than I was getting before. I notice the side that represents the X axis (front and back of the part) on Simplify3d preview screen has some visible banding,(much less than before), then on the Y axis (left and right sides of the part) the banding is almost gone. There's just a faint trace of banding, have to get close and get a good look to see it. So my next question, would the Y axis be affecting my X, or would it be X axis directly related, maybe my X belt, carriage, wheels?? It's strange to see the bands just on both sides of a given axis, and the other axis looks clean. Edited 2 time(s). Last edit at 04/28/2015 12:31PM by prjoe.